Today I’m posting about the last crochet project I’ve been working on. 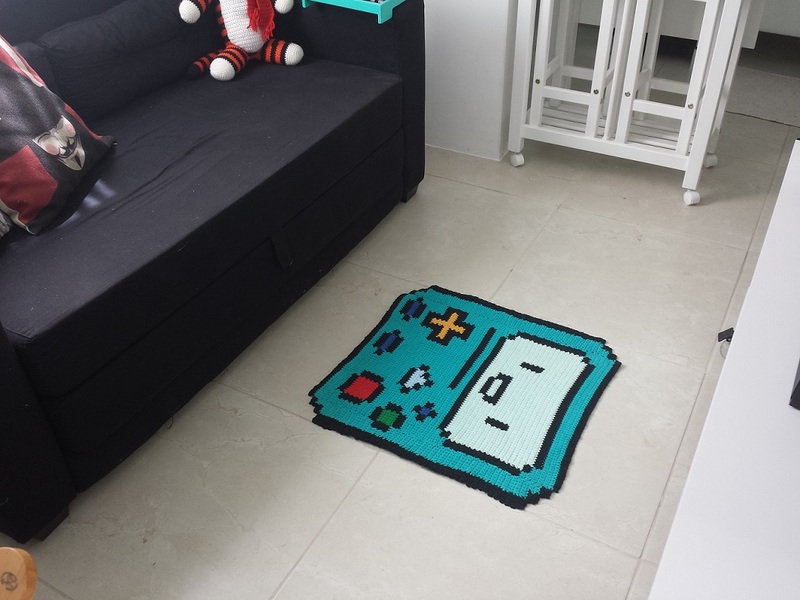 It was a rug for my living room, which I decided to make inspired on BMO from adventure time. The photos are not with a big quality, because I had to use my cellphone to take them. However, as I wanted to make a rug about 80cm (but I got one with 60cm ><“), each pixel of the image could not correspond to each stitch I would make or the rug would be too small. So, in order to solve this problem, I decided that each pixel of the image it would be made by 3 rows of 3 single crochet each (3×3). That means that each pixel would have 3 columns and 3 rows. However, now that I finished it, I didn’t like the choice that I made to make a 3×3 pixel, because my pixel didn’t get the square shape, but a rectangle shape. So, if I decided to make it again, I would try to make a 3 columns and 4 rows pixel. 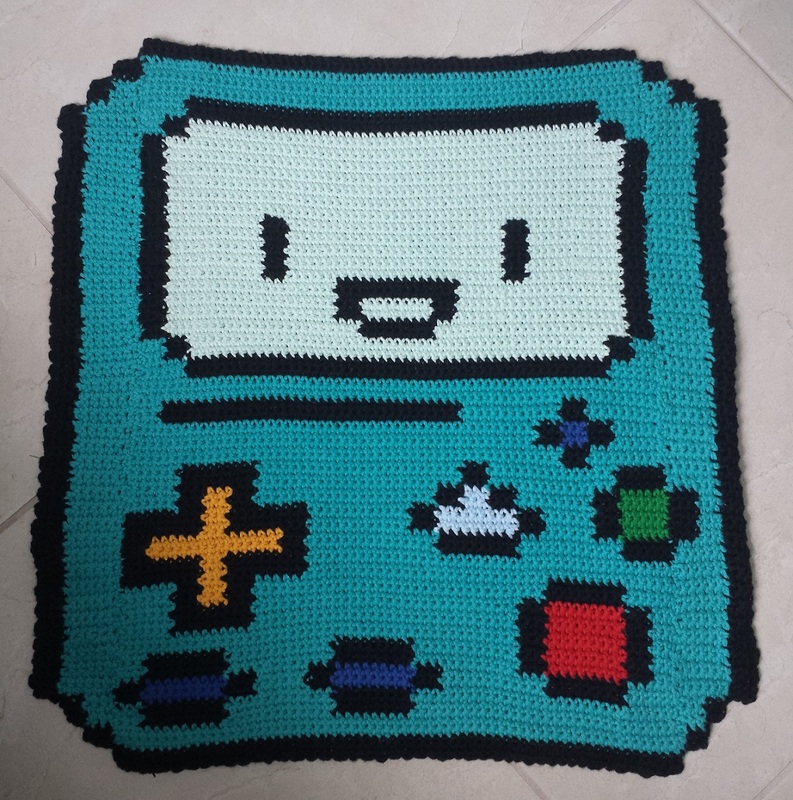 That means that I would make 4 rows, each one with 3 single crochet, to make a pixel. 2. 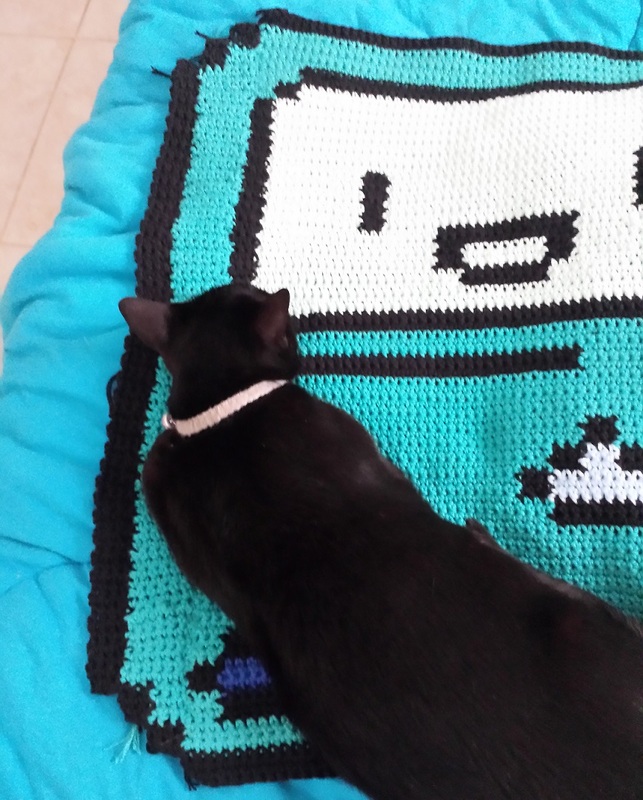 That said, I also figured out that I wasn’t able to crochet BMO in just one single piece, because I couldn’t make the cornes. So, I divided the image into some pieces and crocheted each one and then sew them together. I. First, I crocheted this whole piece. Oh, also I changed the colors of some buttons to look more similar to the original character. I decided to use blue besides of gray and black. First, I crocheted this whole piece. III. That’s it. After I had crocheted all the pieces I just sewed them together. IV. As I didn’t want to hide all the crochet loose tips, I decide to put them to the wrong side and sew a black felt to the rug, hiding all the loose tips. That’s it :) Any doubts feel free to leave a coment or send me an email. 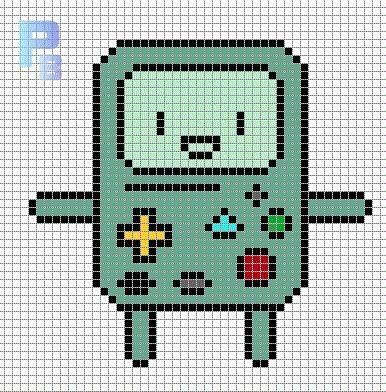 I did not created this character, BMO is copyright of Cartoon Network!! I did not designed this perler bead pattern, which was created by Patrones Beads. I just adapted this pattern to make a crochet rug.